Luxury PU material has a velvet-soft leather feel. Very hard wearing and ideal for everyday use. 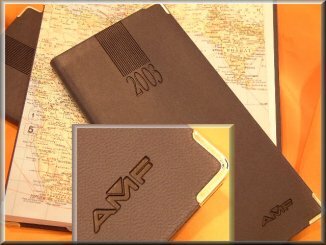 Embossed year, logo or message giving that professional look. Quantities start as little as 50pcs. The most popular colours are Blue, Graphite, Silver and Tan, other colours are available. For more details on this product please click on the trade enquiries button at the top of this page and fill in your details. A5 size made with luxury PU material has a velvet-soft leather feel.